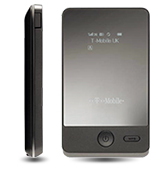 The T-Mobile mobile WiFi device allows you to connect any device that is capable of connecting to the Internet wirelessly wherever there is a signal. This gives you the flexibility to connect a range of devices whilst at home such as xboxes, iPads, laptops, to the Internet with no wires and even no need for a power source as the T-Mobile device can run for 5 hours on a single battery charge. If you are out and about the ability to run the device from the battery allows for maximum flexibility so you are not tied to a power point. A further benefit of this is that you can locate yourself in a position where the device can obtain the best wireless signal possible which may not necessarily be near a power point. Finding a strong WiFi signal is a piece of cake because the device contains an easy to read signal display on the unit so you simply need to keep an eye on the signal monitor and place the device in the optimum spot to get the best throughput on the device. It couldn’t be easier to use this device as it is a simple plug and play device. In other words you just need to add in the SIM card into the SIM card slot on the device (if it hasn’t already been placed in there) and upon the first use of the device when it is plugged into your computer or laptop, the software will automatically install and run itself – just let it run and follow any onscreen instructions. Once the short initial installation has completed you will not need to install the software again – the device will even automatically download and install firmware updates to increase functionality and allow the device to run better over time. Connecting other devices wirelessly is just a case of pairing the T-Mobile WiFi device with the other wireless device. You can do this with multiple devices, all with no wires! T-Mobile offers their WiFi unit on a pay monthly option or a pay per day option. If you choose the pay per month option the unit will be given to you free of charge and you will enter a contract in the same way as you would with a mobile phone contract. If you opt for the pay per day option, there is a one off charge for the unit itself (currently £59.99) and then you simply need to pay for wireless access per day, per week or for a full 30 days access. T-Mobile have acceptable use policies for their mobile WiFi products but if a user was to go over the limit T-Mobile state that they will not charge the user extra fees for going over the download limit. They state that they may restrict usage if limits have been exceeded but no fees will be charged. Currently T-Mobile state the following acceptable use policies on their WiFi network 250MB per day, 500MB for a week, 250MB for any 7 days, or 1GB for 30 days. 1. Carry a broadband signal with you wherever you go. 2. Connect multiple WiFi capable devices to the Internet. 3. There are no cables required. 4. The unit carries a mobile WiFi signal display so you know how strong your signal is wherever you are. 5. There is a Micro SD card slot built in so you can use a memory card to store photos, mp3’s or files on the unit. 6. The device is easy to operate and is plug and play install. 7. You can download at speeds of up to 7.2 Mbps. 8. The unit supports Windows Vista, XP, 7 and Mac 10.4 and above. 9. A flexible range of payment options ranging from pay per day all the way through to a 24 month contract. The T-Mobile Mobile WiFi offers an extremely easy and flexible way to connect a range of Internet capable devices to the web without the use of any wires whatsoever and provides a handy signal strength monitor so you can hunt out the best WIFi spot in your house or whilst you are out and about so you can get the strongest signal possible. Payment options are straightforward and cater for the occasional user to the heavy user with the flexibility of a pay per use or option or a monthly contract for the more frequent user. All things considered a welcome addition to the mobile WiFi market.